Use the template to trace your card onto the cardstock. Trace it again and cut it out leaving some space at the edges – you want the cardstock to show. Adhere the pattern paper to the cardstock base. After they are glued together make a fold mark as seen in the photo. I hope you enjoyed this tutorial. Have a Happy and Safe New Year!! Club House Kudos: Jennifer McGuire, Ink. Question of the day: Is there a new movie coming out in 2010 that you are just dying to see? I have to admit, I am itching to see Johnny Depp in Alice in Wonderland. It promises to be weird and wonderful as Johnny and Tim Burton get together for yet another film. 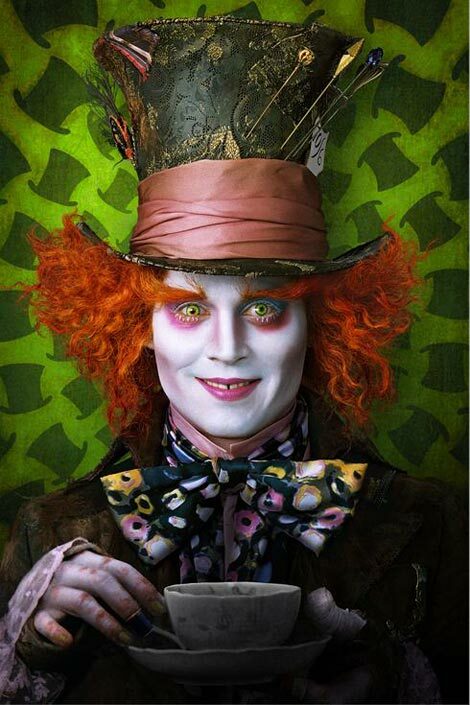 Johnny is the perfect choice for the Mad Hatter, don’t you think? For this week, I challenge you to use an inanimate object as the subject of your focal photo on a layout. So that basically means, no people or pets. It needs to be something else like books (see my example below), food, flowers, etc. Question of the Day: Do you love shopping the Boxing Day sales or do you avoid the malls like the plague? Ribbon is readily available in every colour of the rainbow and in a multitude of textures. Its versatility makes it ideal for the creative genius in you. And, as far as embellishments go, it is quite inexpensive as well—every scrapbooker’s dream! 1. Make a knot, trim off the excess and glue to the center of a flower. 2. Weave it. This can be done by cutting small slits in your paper and weaving the ribbon over and under the page. Alternatively, you can also weave multiple strands of ribbon on the page itself. Mixing widths and textures adds pizzaz! 3. Use it to top a tag. 5. Cut lengths of ribbon. Loop and glue the ends together. Place several of these ribbon loops in a circle formation, placing a large brad paper circle or even a button in the center. Glue. You have now created a ribbon flower! 6. Stamp on it. You may need to heat set your stamping to prevent bleeding. 7. Create pleats for dimension. Glue pleats down with ribbon glue or sew instead. 8. Make your own striped paper using different ribbons instead of using patterned paper. 9. Use it to dangle a charm off of. 10. Make a bow or make knots for a more masculine look. 12. Create photo corners. Start with a 3-inch strip of ribbon (grosgrain works well). Fold both ends down at the midpoint to form a triangle; iron. Repeat until you have two or four ribbons for each picture. Slip triangles—with seams in back—over corners of photos, and use acid-free double-sided photo tape to affix them to album pages. 13. Make curly ribbons by wrapping tightly around a dowel rod or pencil (securing with pins if needed), spraying with a cornstarch solution and baking in the oven for about five minutes. Leave to cool, set over night then remove from the dowel. Great for album covers and bindings. Ribbon can add a little spice to your pages in so many ways! Have fun and feel free to share your ideas and tips for using ribbon in the Comments section below. Question of the Day: What is your favorite embellishment? I have a few Christmas quotes for you today. Some are serious and some are meant to be more light hearted. Enjoy and may you be blessed throughout the holiday season and in the New Year. Merry Christmas! These literally took me minutes and I think they will make a big difference in my decorating. I just took some old vases that were under the sink and wrapped some ribbon around them and then put a flower on one and an ornament on the other. I think I will fill one with candy and then I may make a centerpiece for the table with the other. You could even put a plant in one of them and give as a gift. I hope you like them. I would love to see what you come up with! Have fun! Club House Kudos: Fancy Pants! I love Fancy Pants. Yup, I do. One of my favorite lines ever was Summer Soiree. It was so bright and fun! 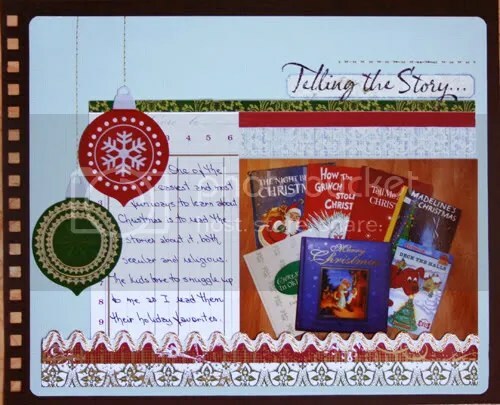 We are giving them kudos today for their wonderful products and, if you check out their blog, you will find some great Christmas layouts, ornament, and other gift ideas too. Definately a nice way to spend the morning, right? Question of the Day: Name something that you have never done but would like to do in the New Year.